Thoughts of a Trainspotting Mathematician: What is... Thameslink? Thameslink is a railway line connecting north and south London via St Pancras, Farringdon, Blackfriars and London Bridge. Think of it as a north-south version of Crossrail, but it's a bit old and naff by comparison. As such it's undergoing a huge £5.5 billion upgrade called the Thameslink Programme, lasting nine years, that will effectively triple Thameslink's capacity. From when it opened in 1988 until 2009, the core section of Thameslink only got 8 trains per hour (tph) in each direction in the rush hours. 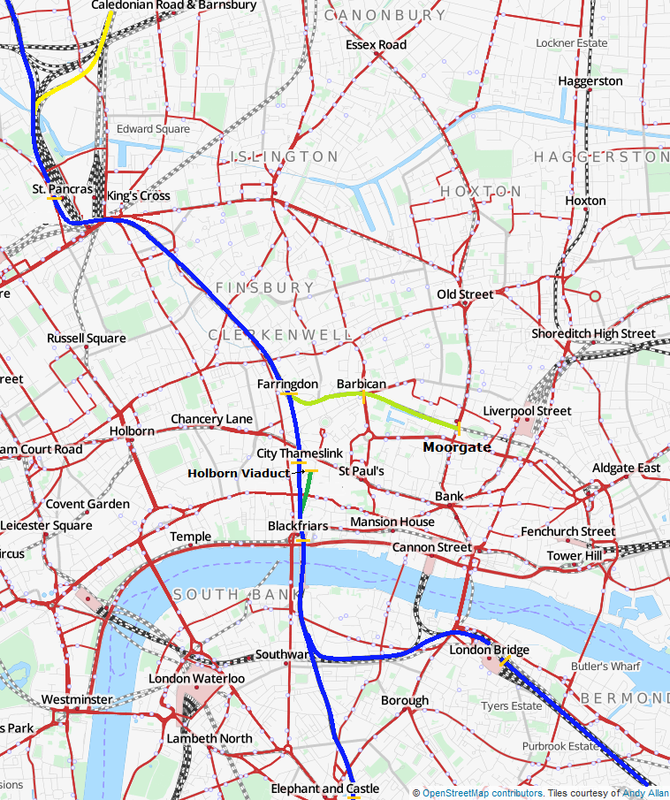 By contrast, Crossrail will get 24tph in each direction (in rush hours) from the day it opens. But then Thameslink was shoehorned into an existing network not remotely designed for it: two completely separate networks north and south of the river were combined into one, meaning 8tph was the limit. The main Thameslink line is in blue; the now-closed lines to Moorgate and Holborn Viaduct are shown in green, and the connection to the ECML which will open in 2018 is shown in yellow. Prior to 1988, suburban services into London on the Midland Main Line (MML) from Bedford and Luton ran to St Pancras and Moorgate. A few of them went to the high level station at St Pancras, rebuilt a just few years ago for the arrival of Eurostar trains. But most used the the "City Widened Lines", a remnant of the old Metropolitan Railway, to go underneath St Pancras to Farringdon and Moorgate, which was much more convenient for the multitude of City commuters (hence the name). While trains to Moorgate couldn't call at St Pancras, they called instead at King's Cross Thameslink, a cramped pair of platforms just east of King's Cross proper on the City Widened Lines. South of the river, most of the suburban services from Kent and Sussex used a variety of stations: about half went to Victoria; the other half went to London Bridge and on to either Charing Cross or Cannon Street. Just a small handful of trains used the two stations at Blackfriars and Holborn Viaduct, both lying on the west edge of the City and mostly eschewed in favour of Cannon Street by City commuters. But connecting Holborn Viaduct and Farringdon, there lay the disused Snow Hill tunnel, built in 1866 to connect the Metropolitan Railway to the lins south of the river, but closed in 1916 to all but a handful of goods trains. The Greater London Council under Ken Livingstone had been campaigning for some time for its reopening, but initially that meant trying to get two completely separate regions of British Rail to work together. In the 1980s, however, the railway was restructured: rather than five regions of BR, new "sectors" were created. Most importantly, Network SouthEast took over responsibility for all commuter services across London and the south-east, giving the railway network one voice for commuters. And Chris Green, as head of NSE, gave his enthusiastic backing to Thameslink: it symbolised perfectly the uniting of London's commuter routes into one coherent network. In 1988, the new Thameslink service began, with trains linking Bedford and Brighton, Luton and Purley, and Cricklewood and Sevenoaks. The service was somewhat tentative at first: the off-peak service consisted of just 6tph, and they ended up clumped so that there were some 20-minute gaps. The morning rush-hour actually had fewer trains through the core, because Thameslink was merely added on top of existing rush-hour service patterns, rather than replacing them. For example, while many of the Midland City services from Bedford and Luton now ran through the Thameslink core to Blackfriars, London Bridge and even all the way to Brighton, there was too much commuter demand to Moorgate to just close it outright and force everyone to use Farringdon. As such, Bedford-Moorgate services remained a feature of the timetable for decades to come, at first just in the peaks, but within a few years a half-hourly all day service had returned to Moorgate. On the other side of the river, Blackfriars and Holborn Viaduct similarly continued to have rush-hour trains which terminated there and didn't run through the core to Farringdon and beyond. There was, however, a key difference between the two: Blackfriars had platforms for the through Thameslink trains to call, but they skirted Holborn Viaduct without calling, easily visible from the end of the platforms. Having two under-used terminals was now rather unnecessary, and the decision was taken to close Holborn Viaduct and divert the remaining peak trains to Blackfriars or through the Thameslink core. But just closing Holborn Viaduct outright would lead to the Ludgate Hill area lacking any kind of railway station; it lay in the no-man's land between the Circle and Central lines, unserved by the Underground at all. So, in an audacious plan, Network SouthEast decided to bury part of the Thameslink line just south of Holborn Viaduct - in the Ludgate Hill area, at the east end of Fleet Street - and provide a replacement station on Thameslink, underground between Farringdon and Blackfriars, so that Holborn Viaduct could finally be put out of its misery, releasing the land for valuable City development. This required ripping up the newly-reopened Thameslink line, digging out a tunnel "box" for the station, and then covering it over - not an easy task. Holborn Viaduct station was closed on January 26th 1990, consigned to the history books. Over the next four months, the railway around Ludgate Hill was completely rebuilt. Incredibly, services continued to run through the Thameslink core during construction works, with just a two-week closure in May 1990 to finish everything off. The new station, originally St Paul's Thameslink but renamed City Thameslink soon after, opened on May 29th 1990. By far the biggest problem for Thameslink, however, was the lack of capacity through London Bridge. With well-established commuter networks ferrying passengers by their thousands into Cannon Street and Charing Cross every weekday morning, all of which had to pass through the seven through lines on the north side of London Bridge station, rail bosses were unwilling to reduce existing services to make room for the new Thameslink services. It's not hard to see why: the regimented service of trains arriving at two-minute intervals into Charing Cross has barely changed since the mid-1970s, principally because it works so well at getting commuters into London. Reducing the service would only serve to make overcrowding worse; and since any improvement in Thameslink services had to be matched by a corresponding decrease in services to Charing Cross, the decision was taken to give the incumbent services priority over new ones. So from the outset, and to this day, Bedford-Brighton services ran via London Bridge in the off-peak only, when there is room to thread them through the Charing Cross services. In rush hours, the same services ran instead via Elephant and Castle, avoiding London Bridge entirely. Operationally this works reasonably well, but it deprived Thameslink commuters access to one of the biggest London stations. In spite of all that, however, Thameslink services were well-used from the outset: those places lucky enough to get a Thameslink service saw a quadrupling in usage within just a year of opening the line. The destinations changed a number of times, but by the turn of the millennium the off-peak service had settled down to 4tph Bedford-Brighton and 4tph Luton-Sutton, the latter via the Wimbledon loop. Indeed, Thameslink ended up becoming something of a victim of its own success: with no capacity available to increase peak services, and the platforms at Farringdon and Blackfriars only long enough for 8-car trains, something big had to happen if Thameslink was ever to solve its overcrowding problem. Enter the Thameslink Programme: a comprehensive upgrade programme, designed to remove the capacity bottlenecks along the route and give Thameslink capacity of its own, obviating the need to share capacity with other services. Such is the extent of the upgrade that it deserves its own blogpost: click here to continue reading about the Thameslink Programme. In the meantime, if you want to read more into the creation of Thameslink, the Network SouthEast chronology is a year-by-year history of NSE with many fascinating tidbits; indeed, the whole site is an invaluable reference. Previous post: What is... Crossrail? Next post: What is... the Thameslink Programme? What is... the Thameslink Programme?